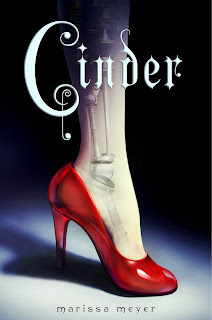 Author Marissa Meyer is doing something that I think is pretty awesome: she's writing a four book series called The Lunar Chronicles, which takes classic fairy tales and re-imagines them in a sci-fi setting far into the future. So. Unbelievably. Awesome. Also, thanks to Rachael, blogger at thebookmuncher.com and marketing intern extraordinaire at Macmillan, for basically hyping me up all day long with her emails about how awesome this book is! Love the idea. I've been waiting for something like this. I love the traditional fairy tales but by combining it with sci-fi is a great idea. Thanks for the post. Agree with you that this one sounds cooler than it looks - and it sounds REALLY good. Thanks for introducing me to it! I have always thought that combining polar opposites-such as a science fiction world with fairytales-makes for the most interesting books because of a human desire for diversity. Do you think so too? I adore fairy tales-- but adding a sci-fi feel to them? Amazing! I wonder how she'll pull it off. I haven't seen this on any other blogs, just yours, but the cover is stunning. The red of the shoe just pops. Definitely a book I'll pre-order in the future! I LOVE this idea. Wish I'd thought of it myself. It sounds like a great book, and I really like the cover. I can't wait to see what it's like after it's released. Thanks for letting me know about this great reading opportunity. I really appreciate it! Have a great day, and happy reading! I'm seriously crazy about this one! This sounds like it could be awesome. I will look for it in January!